Site of the first bomb ever dropped on central London. Continuing our series looking at locations in London that still bear the scars of war. A quarter century before The Blitz, London was under bombardment from the air. Silent but deadly, the creeping menace of the German airship was wreaking havoc on the city. 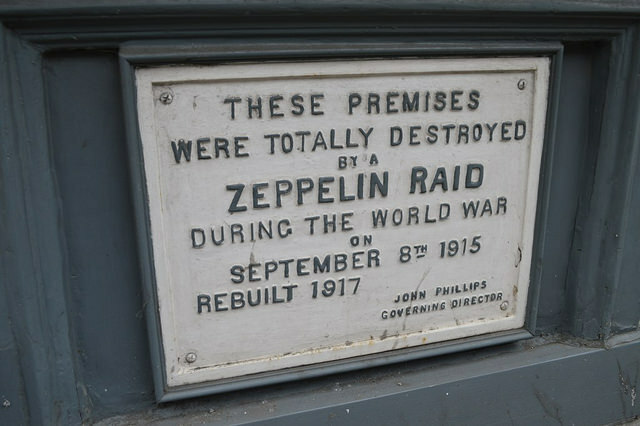 On 8 September 1915, one such raid brought calamity to the Holborn and City areas. A solitary Zeppelin, commanded by Heinrich Mathy, dropped 15 high explosives and many more incendiaries. The first explosive ever to detonate on central London landed in Queen's Square. It missed the surrounding hospital buildings, but shattered many windows. 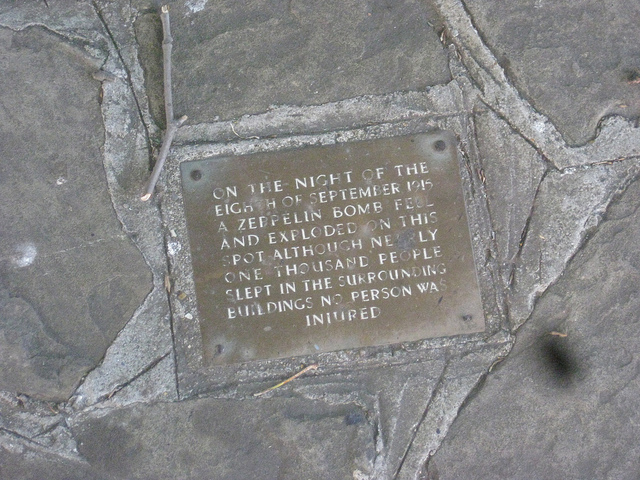 A small, difficult-to-spot plaque (see above) marks the site to this day. The Zeppelin continued on its course eastwards. Another bomb smashed into the Dolphin Pub on Red Lion Street, killing a man outside. The pub's clock was frozen in time by the blast, and can still be seen behind the bar of this traditional boozer. Legends of a ghostly tick-tocking have surrounded the premises ever since. The carnage continued. Three children were killed when bombs hit Portpool Lane, and many more injured. Leather Lane and Hatton Garden also took a pounding. A bomb on Farringdon Road completely levelled one warehouse. 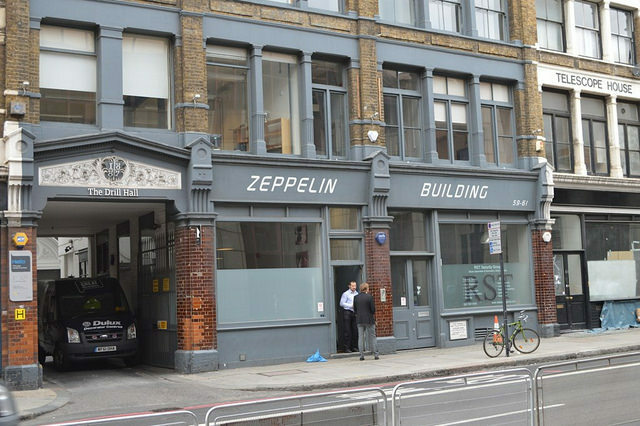 It was later rebuilt as the Zeppelin Building, and carries a plaque to record the event. The biggest bomb of all, a 660 pounder, was reserved for Smithfield. It blasted a huge hole in the ground, killing two men and devastating surrounding buildings. (The shrapnel scars still visible on the walls of Bart's hospital are from a later raid.) From here the Zeppelin continued across the Square Mile. Its "horrific finale" was to destroy two buses in the Liverpool Street area, killing and injuring many. The wider raid was the most destructive of the war. 22 were killed, and 87 injured, and the resulting damage was estimated at £23 million in today's money. Was St Paul's used as a cultural shield? After returning to Germany, Zeppelin commander Mathey gave an interview to New York World. "I had strict orders to do everything possible to avoid hitting St Paul's and other churches, museums, the Palace, Westminster Abbey, the Parliament Houses and, of course, residential districts," he claimed. Reluctant to return the favour, however, the military placed anti-aircraft guns within St Paul's — or so Mathey claimed, having watched the flak streaming towards his airship. "I don't think the English should use their churches, museums and similar buildings as cover or protection for their guns." The authorities denied using such a 'cultural shield'. A Home Office statement claimed this "could only be characterised as a falsehood apparently intended to excuse what German aircraft are attempting to do." Sources: Raid details from Ian Castle's book London 1914-17, published by Osprey. Mathey quotes from Exeter and Plymouth Gazette, 25 September 1915 via British Newspaper Archive. The Scarred Sphinx: hit on Cleopatra's Needle kills three.